The Salomon X Max 120 has been evo's biggest selling narrow expert boot since we can remember, and Salomon knew a successor had to be worthy. Not to worry, the Salomon S/Max 120 Ski Boots comes to market with the same great out-of-the-box fit (with a touch more instep height), more precise control, and drastically reduced weight. 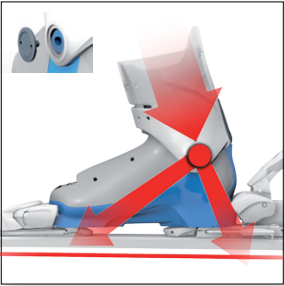 You heard right, the new S/Max uses Core-Frame reinforcement under the midfoot to stiffen the boot where it counts while shaving mass elsewhere. A new Sense Amplifier cuff provides quicker response and better snow feel. And the new Custom Shell HD plastics heat mold in a fraction of the time of the old boots. If you're shopping for a powerful alpine boot that doesn't come with the pain penalty of a race-oriented plug boot, check out the S/Max 120 and get ready to smile. Last: 98mm – Narrow last for slim to normal width feet with normal volume. Can be heat molded using the custom heat molding process to approximately 104mm in the forefoot. Custom Shell HD – Salomon's proven heat molding process makes boot fitting most feet quick and easy - the latest Custom Shell HD version is even quicker to mold than before. Bootfitter's Notes – The new S/Max last is 1 mm taller in the instep than the X Max. Flex: 120 – A stiff flex suitable for advanced to expert level all-mountain skiers. Sense Amplifier Cuff – A new cuff design that promotes quicker rebound and better snow feel. 2 Position strap lets you select the level of power and rebound. Seamless Pro Liner – Remember those pesky seams you feel on your little toes? They're gone in the S/Max liner . . .
Core-Frame Construction – A thinner walled Sensitive Shell is reinforced by the Core-Frame element that runs under the midfoot from maleolus to maleolus and stiffens the shell where you drive the ski with a minimum of added weight. Delivers precise terrain feedback and maximum power transmission to the edges. 24mm Oversized Pivot – Reduced play for extreme precision and direct power transmission. Because many modern all mountain skis are wider, they require more torque to stay on edge. Oversized Pivot answers the need of wider skis.